I never thought I would belong to the "preemie" club or heck the "micro preemie" club but here I am. 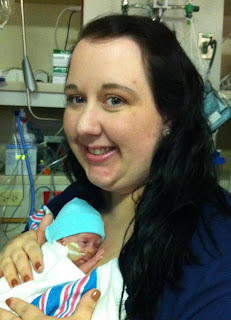 Before I had Liam I never thought of preemies. I had no idea how strong these babies were and the amazing advancements of medicine to keep these miracles alive. Before becoming a preemie mom I had no idea that 1 out of 8 babies are born premature. That seems like a pretty high statistic to me and I wish it was lower. However, it does seem to be true in my family circle. My mom has 7 grandkids and 1 was born premature so it is a scary statistic that hits close to home. Today, I wore purple in honor of National Prematurity Awareness Day. Liam and I got some good snuggle time. I'm a proud preemie mommy.